← January 31, 2016 – Too tired to cook! This is a real favorite of mine as you can tell since we ate the same dinner last week. 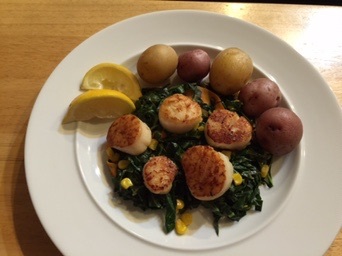 John seared the sea scallops while I steamed the potatoes and cooked the collards and corn. This time when making the collards greens, I put in some carrot shavings. The collard greens we bought were huge dark green leaves and tasted more bitter than usual. I figured that the carrot would sweeten the dish up. With the corn and carrot to counteract the bitterness and a teaspoon of butter for a hint of richness, the dish was a success. This entry was posted in Shellfish and tagged collard greens, new potatoes, scallops. Bookmark the permalink.